Traditionally it has been considered lucky to gain a part of the brides clothing. Guests would grab at her dress and try to tear off pieces. Although they were not going to wear the dress again brides did not want it destroyed. Looking for a better alternative they began the custom of throwing the brides wedding garter to the guests which could then be divided amongst them. Today the tradition is very similar to that of the bride tossing the bouquet to all the single female guests. 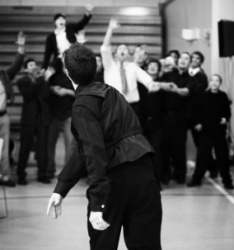 The groom throws the wedding garter to all the single men. It is believed that whichever groomsmen catches the wedding garter will be the next to marry. If you do not wish to take part in the garter toss, maybe give the bridal garter to the next couple you know who are going to be married. This will in turn bring them luck on their wedding day and future life together. Another wedding tradition that we have all probably heard is that a bride should have ‘something old. something new, something borrowed, something blue…’ A wedding garter from Laura George could be part of this tradition which brings the couple infinite luck, joy and happiness.